The Rebel Sweetheart. : Fashion Pulse | Boots! I love boots. They come third in my list of favorite footwear, next to sneakers and flip flops. If only the hot and humid Philippine weather would allow me to wear boots more often, I would. Or if only we had autumn or winter in this country, then my boots wouldn't have to be stored in the closet for so long. Which is why I'm planning to bring some of my favorite pairs when I travel to South Korea in December (here's hoping that this trip finally happens this year). The streets of Myeongdong will be the perfect place to strut in style with my favorite trench coat and lace-up boots. I can even have my hair cropped this short to complete the whole Emma Watson peg, haha! Or for a more laid-back look, I can wear my suede ankle boots with a plain white shirt and jeans. Something like this, but sans the hat. Photo credit: Beauty and Le Chic. Of course, I'll also be bringing along my most favorite pair of all - my shiny, lavender Doc Martens. This fun and funky number works well with just about anything - shirt and jeans, cropped tee and shorts, a frilly blouse and short skirt, or a dress even! 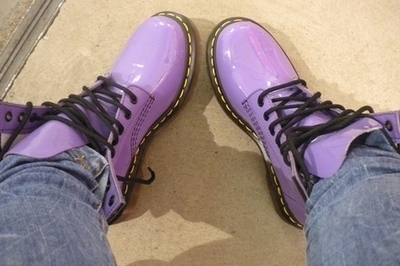 I love the shiny purple Doc Martens! I love the purple doc martin boots. I miss having a pair boots for winter time. That's a gorgeous pair of Doc martens! it matches my patent purple LV. They have been my favorite style of shoe since I was a kid! gladly we can wear those here in Dubai during winter until early spring. I tend to lean though on cowboy style boots. The purple Doc Martens look so cool. I'm sure you're gonna look real good when your Korea trip pushes through. i also love to wear boots but its just really kinda awkward to wear when i thought that its going to rain hard yet when i arrive to malls, humid and hot air ever approaches. argh. hahaha, reklamadora. When I went to Korea I wore a pair of Mizuno rubber shoes because I was expecting a whole lot of walking and I couldn't afford to take my chances on shoes that could potentially be painful during the trip. Lately I just wear Fitflops when travelling, hehe. Oh Em Gee. You just combined two of my favorite things. BOOTS and the COLOR VIOLET. I LOVE THOOOOOSE BOOOTS! I'm a big fan of boots. I dont care if its inappropriate for our weather. If I can pull it off in an outfit, I'd wear boots. hehe. So yeah. Boots. LOLz. Have fun in Korea!